PrismaGuard™ by Therma-Tru® is a finish for fiberglass doors that combines durability with the natural look of real wood. It is simply the most authentic looking finish on a fiberglass door. 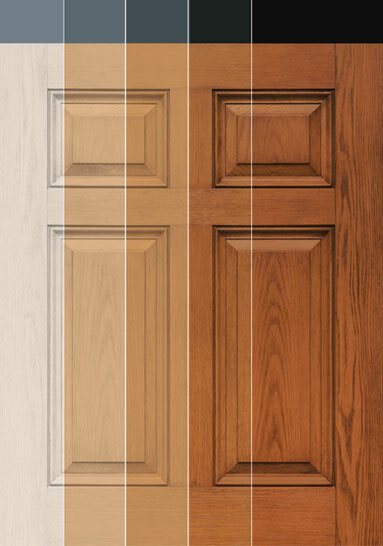 A beautiful stained look from edge to edge - In addition to finishing the door, Reeb® Finish will stain On-Guard™ composite or solid wood frames for a complete pre-finished door unit. Each door is carefully inspected and prepared for the staining process prior to entering the coating area. All components are wiped clean, glass is taped-off and edges are prepared to ensure proper base-coat application. All components are inspected a second time before receiving the base coat that will serve as the foundation of the door’s final color. Stain coat is applied and hand-brushed by skilled Reeb Finish craftsmen to replicate the attractive color variations and inconsistencies found in real wood. This enhances the intricate grain patterns and deep embossments found in Therma-Tru® fiberglass doors. The preliminary top coat seals the finish and enhances the colors highlighted in the staining process, adding durability and sheen to the final product. The fourth and final coating further accentuates the unique beauty of the finished product and is essential to provide maximum durability and protection from the elements.